Volunteers have put on a free hourly bus service for people in Cumbria on Boxing Day. The service, provided by volunteers at the Workington Transport Heritage Trust, was for people needing public transport to and from Workington. The service linked the town's bus station, Seaton, Moorclose, Salterbeck and Harrington. Alistair Grey, the trust's secretary who started the service in 2004, said 230 people used the service in 2011. He said: "We run this service every year as a thank-you to the community for their support throughout the year." A memorable year for Mr Grey came in 2009 when Cumbria was hit with floods. He said: "The town was split in two by the floods. 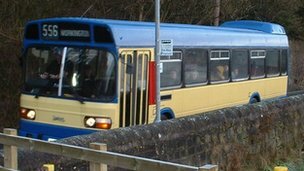 We had two buses in operation - one running north from the temporary Barkers Crossing footbridge to Seaton and Maryport, with another connecting on the south side to the town centre, and estates towards Harrington. "There were 567 passenger journeys were recorded between the two buses that year." One of the volunteers, Bill McKenzie, has been a fan of buses since he was five years old when he father worked as a conductor. He said: "I've always maintained an interest in buses, particularly when a new model came along, both as a child and later as an adult. "As I have recently retired it seemed an ideal opportunity to volunteer with Workington Transport Heritage Trust so that I could spend some time chatting with like-minded individuals as well as restoring and occasionally driving some of the vehicles owned. "I am looking forward to Workington Transport Heritage Trust hopefully moving to more permanent premises at some point in the future when there might be scope to introduce other types of vehicles, as this would add interest from the point of view of establishing a transport museum.